This week's tablehopper: is it happy hour yet? I wish I had this cocktail in front of me right now: Becky with the Good Hair, at the brand-new Prairie! Photo: © tablehopper.com. Oh, hi there. Yeah, today’s issue is late—it was trying to drown me! At least there are a bunch of fun news items in today’s column. And just in case you want some more, this week’s Table Talk has plenty of goodies in it too (and trust me, you don’t want to miss reading about the pork sung roll!). I also have this recent post I wrote for Blackboard Eats on some of the best SF counter-service restaurants, because SF sure is tough on the wallet these days. Tickets are now available for the Macy’s Culinary Council panel I mentioned a couple weeks ago! Joining me are Reem Assil, Dani Boglivi-Fiori, Shirley Chung, Dominica Rice-Cisneros, Tanya Holland, and host Yvonne Kim. We’ll be discussing what it’s like to be a woman in the culinary industry on Thursday October 25th at 6pm at Macy’s Union Square. Hope to see you there. Fempire in the house. Tonight, I can’t believe I get to see René Redzepi and David Zilber at their sold-out talk at the JCCSF—they’ll be talking about their brand-new book, The Noma Guide to Fermentation. The JCCSF is producing some great culinary events—check out this one coming up with Magnus Nilsson and this event with chef Crystal Wahpepah, who will be discussing Native American cuisine. Did any of you go to the Treasure Island Music Festival this past weekend? You couldn’t have asked for better weather, what a gift. I only made it on Sunday, but seeing Tame Impala play the most incredible set left me feeling amazed—their show was truly a thing of beauty. It was also so refreshing to see so many female artists on Sunday, and art, and the dreamy music at sunset was just peachy (it helped make up for all the dust, which was the opposite of fresh). Okay, let’s dive in here. Would love to see you at Macy’s next week! Brenda Buenviaje and Libby Truesdell Opening Brenda's in Oakland in 2019! Brenda’s famed crawfish beignets. Photo: Libby Truesdell. A po’boy from Brenda’s Meat & Three. Photo via Facebook. You know what makes me happy? When one of the first chefs I ever interviewed, oh, like 14 years ago (back in 2004!) gets in touch to let me know about her new project. That would be Brenda Buenviaje of local Brenda’s fame—I met her when she was working at Café Claude, way back when! It has been so rewarding to watch her business grow with her wife and business partner, Libby Truesdell, which includes our city’s beloved Brenda’s French Soul Food, Brenda’s Meat & Three, and Libby Jane Cafe. But now, the ladies are heading across the Bay and will be opening ~BRENDA’S~ in Temescal! Brenda tells me they have been looking for a location in Oakland for a couple years, and are thrilled to be opening in a new building (which will include apartments above), the Maya, at Broadway and 41st. It’s about six months out, so we’re looking at late spring 2019. Brenda’s will be fast-casual, and will feature the best of their signature items, like beignets, brunch items, fried chicken, and po’boys (with some new ones coming too). Since the area is more residential, they will have some kid-friendly additions like milkshakes, and some family meals (with chicken!) to bring home. It’s important to them to have Brenda’s be accessible to all. The corner space is a new buildout, but will feature the Brenda’s southern diner style, with hardwood floors, ceiling tiles, murals, and there will be big windows, including exhibition windows from the street onto the kitchen so you can watch them make beignets! There will be some counter seats, and outdoor seating as well. Hours will be Wed-Mon 8am-10pm (closed Tue), serving breakfast and brunch and then transitioning to lunch/supper/dinner service. Stand by for more details as the project takes shape. Oakland, get excited—the beignets are coming. 4045 Broadway at 41st St., Oakland. The dining room at Prairie. Photo courtesy of Prairie. Guanciale-wrapped mochi in a radicchio leaf. Photo: © tablehopper.com. Pane distrutto—get it while you can. Photo: © tablehopper.com. Berkshire spare ribs with a Calabrian XO rub. Photo: © tablehopper.com. 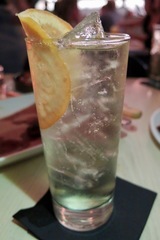 The delightfully fizzy Suntory Toki highball with grapefruit. Photo: © tablehopper.com. I’ve been keeping you posted about the opening of chef Anthony Strong’s ~PRAIRIE~ in the former Hog & Rocks location in the Mission, and now I have a firsthand update for you since I was invited for an opening night meal last week! He’s done an impressive remodel of the space, sporting a crisp look with white ash tables and natural modern chairs, and the walls feature wood panels dyed a deep indigo. Add in the modern light fixtures, groovy scene at the eight-seat bar, retro artwork, and eclectic, upbeat soundtrack, and you’ve got a fun scene happening here. Oh yeah, and a madonna at the door to greet you (nothing like sourcing some South San Francisco statuary to add some Neapolitan vibes). You’ll also notice that the infamous din that was at Hog & Rocks has disappeared—they added some sound-dampening panels, and even more should be coming soon. Your server will check in with you, but it’s pretty much up to you to grab a red pencil on the table and start selecting what you want to eat off the menu. While Strong is known for his years of making Italian food, at Prairie, he’s showing his love of Japanese cuisine and ingredients, along with Chinese influences, and some other items he’s pulling from his food lover’s pantry. It’s freestyle, creative, and meant to be shared. Start with the guanciale-wrapped mochi ($4 each), nestled inside radicchio, with some nori and a few dollops of syrupy aged balsamic. Another bite you’ll need to indulge in while you can is the pane distrutto ($4), a craggy piece of olive oil-toasted bread soaked with early girl tomato juices—it’s basically a total mouthful of end-of-summer bliss. I also stepped a foot into fall with the chicories salad ($11), with a dressing that nods toward a Caesar, but of course we added some hot guanciale on top ($4). The menu has plenty of vegetarian and vegetable-focused dishes, and there is even a keto designation on dishes. Pastas include plump Gulf shrimp and burrata tortelli ($19), and buttered tagliatelle with a rich sugo of chicken bits and Parmigiano ($18), almost like a satisfying Italian stroganoff that you mix into the noodles, but with chicken. The kitchen’s two charcoal grills (a Josper from Spain and a J&R Woodshow Broiler from Texas) are the masters behind half of the menu, giving a smoky kiss to dishes like meaty Berkshire spare ribs ($25) with a Calabrian XO rub (it’s almost like you’re eating in an awesome Chinese restaurant in Italy), and the platter of lamb blade chops ($27) with arugula and lemon at the table next to us looked like something I’d have at a dream grigliata for Ferragosto in Italy. I’ll be coming back for the marrow bones ($22) with a sherry luge, which are right where they should be: in the “fun” section on the menu. 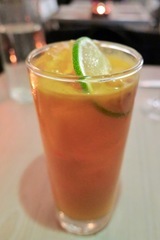 The cocktail list features some fabulously carbonated highballs, thanks to the Suntory Toki highball machine (I was way into my Suntory Toki with grapefruit, so refreshing alongside the smoky ribs). Becky with the Good Hair ($13) is a beaut, a golden-orange gin cocktail with lime and a turmeric-sea buckthorn shrub that almost tasted healthy (I fell in love with sea buckthorn while traveling in Russia). The Italian-leaning wine list has all kinds of food-friendly selections available by the glass or bottle (Anthony worked with LA-based Lucid Selections on it), and there are five beers on draft, with some Japanese beers by the bottle. Be sure to check out the “Not-A-Flamethrower” on a back bar shelf (it’s locked! ), released in limited numbers by Elon Musk’s Boring Company. (Don’t worry, they won’t be using it on any drinks or customers.) There’s also some outdoor seating, and brunch is coming soon. Dinner served Tue-Sun beginning at 5:30pm. Note that an 18 percent service charge will be added to each bill in lieu of tips (this allows them to provide better wages and benefits to every member of the team), plus a 4 percent surcharge for SF employer mandates (“Healthy SF”). 3431 19th St. (between Valencia and Mission), 415-483-1112. Jay Foster doing his magic at Isla Vida. Photo: Melissa de Mata. Get ready to tuck into quite the Afro-Caribbean spread at Isla Vida. Photo: Melissa de Mata. Congrats to Jay Foster, Matthew Washington, and Erin Traylor for getting ~ISLA VIDA AFRO-CARIBBEAN GRILL~ open in the Fillmore District—they just did a trial run over the weekend! Boom. To recap, this black-owned business took over the former Black Bark BBQ space, and they’re interested in hiring people from the Fillmore neighborhood (as they say in a press fact sheet: “Training and mentoring is an integral part to the Isla Vida mission and vision of bringing Black-owned businesses back to the Fillmore neighborhood.”). They are offering a fast-casual experience, and intend to run their own delivery service. Hours will be Wed-Sun 11am-8pm, with plans to open at 10am on the weekends for brunch soon (there’s outdoor seating too!). Welcome to the neighborhood! 1325 Fillmore St. at Ellis. The trio of half-rolls and seasoned fries at Luke’s Lobster. Photo: © tablehopper.com. A shrimp roll and slaw. Photo: © tablehopper.com. The back wall at Luke’s Lobster, complete with buoys and the historic building’s exposed lathe. Photo: Isabel Baer. Last week, I attended a preview of ~LUKE’S LOBSTER~, an import from the East Coast (the founders are third-generation lobsterman Luke Holden and partner Ben Conniff). It’s a fast-casual spot, focused on lobster, crab, and shrimp rolls in buttered, split-top rolls, plus clam chowder, lobster-corn chowder, Patagonia Provisions’ smoked mussels, and more. Luke’s Lobster is a vertically integrated seafood company, which means they oversee every step of the supply chain (“from dock to table”), and are committed to serving high-quality and responsibly sourced seafood. The chalkboard in the shop lists the harbors where the seafood is from, and is updated daily. One interesting thing they do is after lobster is purchased from their fishermen partners in Maine and Canada, it’s brought immediately to Luke’s Lobster Seafood Company in Saco, Maine, where it’s separated, size-graded, steamed, picked, and packed, and then distributed to Luke’s Lobster’s shacks nationwide. Luke’s Lobster Seafood Company is the only seafood company in North America to be both Marine Stewardship Council [MSC] certified for sustainability and Safe Quality Food [SQF] Level 3-certified for quality and safety. I recommend trying their trio of half-rolls to start ($19), but if you know you want to hit the lobster, go for it—you get a 1/4 lb. of chilled, wild-caught lobster in a buttery split-top bun with lemon melted butter, mayo, and their secret seasoning (it’s $16). I like how lightly dressed it was, and because of the way they sort and prepare the lobster meat separately, none of the pieces were over-cooked. You can also trade out the bun for salad ($1 extra). A side of their poppyseed slaw ($2) and seasoned fries ($3) complete the picture. Here’s the current menu, which also includes calories (it’s not as bad as you may think) and their full happy hour offering (check out the Jonah crab claw platter!). There are craft beers and wines as well, and there’s a unique beer they’re pouring in collaboration with Black Hammer Brewing—the limited-run beer was brewed with lobster shells and kelp! The corner location in SoMa has a lot of historic touches, from the vintage terrazzo floor to the brick and exposed lathe walls, with large windows and outdoor seating. It’s in the Bourdette Building, which was the only commercial downtown building to survive the 1906 earthquake and fire (she’s tough like that). And you don’t want to miss the lobster boat soundtrack in the bathroom, complete with seagull squawks. According to Yelp posts, the opening has been a little hectic, so think about giving them a little time, and then pre-ordering via their app would be the move. Open Mon-Fri 11am-9pm, Sat-Sun 12pm-7pm. There’s also a happy hour every day from 4pm-7pm, with $2 off all beer and wine, plus mini lobster rolls, and a special on a lobster roll and a beer for $19. 92 2nd St. at Mission, 415-483-1580. 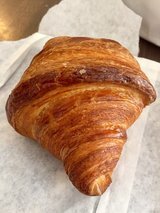 Croissant perfection at Arsicault Bakery. Yelp photo by Stephanie L.
The colorful bar at the new SOMA Eats. Photo: Craig Hackey. Shirley Azzghayer and Oussama Mannaa have opened a second location of ~SOMA EATS~ on the Embarcadero in the Rincon Tower on Spear Street. The fine-casual menu is Middle Eastern-inspired Californian cuisine, and includes breakfast items and a variety of salads and sandwiches for lunch. The new location will additionally serve a lamb tagine bowl, lentil protein bowl, and pomegranate chicken bowl. There’s also a staggering number of beers (over 300!) and wine, with 9 beers and 6 wines on tap, and they added espresso service. The space includes a U-shaped bar, bright turquoise tiles, and a large TV to watch games. Hours to start are Mon-Fri 7am-2pm (breakfast and lunch), with happy hour, a full-service night menu, and craft low-ABV cocktails to follow. 121 Spear St. at Howard. A tablehopper reader tipped me off that the owner of PPQ Crab Dungeness Island (Sam Chang) is opening a business in the Sunset called ~GOLDEN CRAB HOUSE~. It’s going into the Nami Ramen location, and is reportedly opening soon. 1830 Irving St. at 20th Ave. The team behind Finn Town and Papi Rico are planning to open ~LITTLE FINN EMPORIUM~ in the Castro in spring 2019, offering sandwiches, soups, salads, charcuterie, and cheeses, as well as “Daddycakes” original baked goods (from Lori Baker) and Coletta organic gelato, plus catering platters designed for easy delivery. Stand by for more. 2215 Market St. at Noe. Was sorry to read that ~LA VICTORIA BAKERY~ has closed after 67 years in the Mission. You can read more about the family dispute that brought it down in this Chronicle article. 2937 24th St. at Alabama. I received a note from the ~PRUBECHU~ team that their landlord has granted them an extension on their space until November 1st (they initially closed on September 29th), so you can come by for dinner and show support for chef Shawn Naputi and general manager Shawn Camacho until October 31st. Book your reservation now! Here’s hoping they find a new space soon. 2847 Mission St. at 24th St. I have some local food news updates for you, starting with the announcement of the nominations for the Golden Gate Restaurant Association’s third annual Saucy Awards! Take a look to see who is up for Chef of the Year, Beverage Professional of the Year, and many more categories, 21 in all. (I was honored to be a part of the steering committee again this year—the committee was in charge of narrowing down the nominations to four finalists per category.) I’m also so happy to see Nancy Oakes is receiving the GGRA’s Lifetime Achievement Award. And Mayor London Breed will give a keynote speech recognizing the Bay Area hospitality community and all of the honorees. Winners will be announced at a gala on Monday November 12th, at the historic Herbst Theater. Get your tickets here, $149 each, which include the awards ceremony and a post-reception catered by Meadowood Catering. 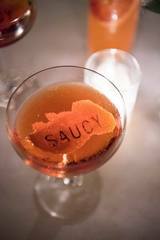 The Saucys benefit the non-profit Golden Gate Restaurant Association Scholarship & Education Foundation (GGRASF). See you there! 7pm. 401 Van Ness Ave. at McAllister. I haven’t had a free moment to tune in yet, but big congrats to Samin Nosrat for her new documentary series that just launched on Netflix, Salt Fat Acid Heat, based on her New York Times best-selling cookbook! You get to armchair travel to Italy, Japan, the Yucatán, and back home to Chez Panisse. Check it out (and you’ll improve your cooking skills). Camino in the evening. Photo via Facebook. Bardo’s upstairs dining room. Photo: Anna Wick. The fun, midcentury style at Bardo Lounge & Supper Club. Photo: Anna Wick. A dish from the duo behind Abstract Table. Photo via Abstract Table’s Facebook page. It was already unexpected news when ~CAMINO~’s owners Russell Moore and Allison Hopelain announced they’re closing their 10-year-old Oakland restaurant at the end of December (operating costs and staffing are a challenge, a problem throughout the Bay Area, and they’re also ready for a break). Their other project, The Kebabery, will remain open. Seth and Jenni Bregman have opened their first project in the former Michel Bistro in the Lakeshore neighborhood, ~BARDO LOUNGE &AMP; SUPPER CLUB~, and it’s a swanky and fun-looking spot. It’s designed to feel like a midcentury modern dinner party, with a retro living room atmosphere, complete with vintage furnishings and glassware. The food (from Anthony Salguero and Brian Starkey) and cocktails from Jason Huffman also have a throwback feel, with some modern touches. Come by for happy hour, dinner (served upstairs, for $59), or late-night bites—weekend brunch will be coming later. Open Wed-Mon 5pm-2pm (dinner from 5:30pm-9pm, Fri-Sat until 10pm; snacks until 12am, and 1am Fri-Sat). 3343 Lakeshore Ave. at Trestle Glen, Oakland, 510-836-8737. 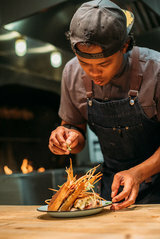 Chefs (and conceptual artists) Andrew Greene and Duncan Kwitkor have made their Abstract Table pop-up dinner series a permanent fixture at The Gastropig in Uptown Oakland. They serve a five-course ($50 per person) and seven-course ($70 per person) tasting menu that rotates every three months, and is treated like a dining “exhibition,” but unlike most art galleries, is meant to be unpretentious and relaxed. Their next one will be “Blizzards,” beginning December 7th, and will take diners on a culinary journey through the winters of Japan and Scandinavia. Sake, beer, and wine are also available. Reservations for this series will be available on Resy.com starting November 7th. 2123 Franklin St. at 21st St., Oakland. He’s baaaaaack, just in time for Halloween nightmares. Chef Charlie Hallowell, accused of sexual harassment by more than 30 employees, has released a 12-point plan that is supposed to be a roadmap for his return to work after stepping away the past 10 months. The fact that he thought the inclusion of a monthly dunk tank in the plan was a good idea (are you frigging kidding me? ), and that (now) co-owner and managing partner Donna Insalaco signed off on it, shows a pretty twisted sense of reality (and of restaurant culture, and how to make amends). Yup, a dunk tank is really going to lighten things up. Way to diminish the weight of all the pain, damage, abuse, and suffering he has inflicted on far too many employees. Its inclusion nullifies every other point in his “plan.” And to think they are also gunning to open a new restaurant in Berkeley, Western Pacific. His hubris is as infuriating as it is staggering. It’s time for Harvey Weinstein to buy some remote property and create Shame Island—we have plenty of men to send there to keep him company, starting with this guy. One-way ticket only. Let’s end this piece on a positive note by focusing on news from a female- and black-owned business: ~CUPCAKIN’ BAKE SHOP~ has relocated to Telegraph Avenue in Berkeley. Owner and Oakland native Lila Owens has moved her five-year-old bake shop to a larger, brighter, and contemporary space, offering her scratch-made cupcakes in more than a dozen rotating and seasonal flavors, as well as gluten-free and vegan options. Owens will open two additional Cupcakin’ locations later this fall: the first in early November at Swan’s Market in Old Oakland, and the second in early December in the space formerly occupied by Virginia Bakery at 1690 Shattuck Avenue in North Berkeley. The Shattuck location will serve as the commissary kitchen for all three bake shops and the catering business. Open Mon-Sat 11am-9pm and Sun 11am-6pm. 2391 Telegraph Ave. at Channing, Berkeley. Want to learn more about tea? Already an expert and want to meet fellow tea lovers and talk to the people behind the brands? Savor and discover hundreds of different teas on Saturday November 3rd and Sunday November 4th at the seventh annual San Francisco International Tea Festival. 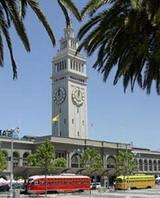 Held in SF’s historic Ferry Building Marketplace on the Embarcadero, this event brings tea brands to local tea lovers. General admission includes a porcelain tasting cup, from which guests can sample different teas from vendors at the event. Guests also receive a free swag bag filled with a ton of samples and goodies to continue the experience at home. Industry experts will be giving free lectures on both days for guests to up their tea knowledge. The nearly 40 vendors at the festival include a range of brands from the Bay Area and around the world. Be on the look-out for brands specializing in innovative teas, such as Kikoko (cannabis-infused teas) and The Chaga Company (mushroom teas). Join us to celebrate the release of EDIBLES: Small Bites for the Modern Cannabis Kitchen! The ideal book for anyone who wants to try cannabis cooking but doesn’t know where to start, EDIBLES centers on low-dose, delicious dishes, with a focus on entertaining. This beautiful collection of 30 recipes ventures boldly “beyond the brownie” with tasty, unique, and innovative treats. At this event, authors Stephanie Hua and Coreen Carroll will demonstrate how to make your own cannabis infusion at home. They will answer all your burning questions about cooking with cannabis and give you tips and tricks on how to elevate your entertaining with gourmet edibles that taste and feel good. Join us and take your culinary experiments to new heights. Rapper and stylin’ host of Vice’s Most Expensiveist show ~2 Chainz~ dined with a group in the private room at ~FANG RESTAURANT~ in SoMa. Details are slim, but it looks like he brought plenty of his own ice. We are looking for a great sous chef to join the team! One-year minimum as a sous chef or a talented line cook ready to take the next step. Seeking lead line cooks for Michael Mina’s newest concept opening in Salesforce Tower this November! Inspired by the lifestyle and culture of Hawaii, Trailblazer Tavern marries the unmatched talent and expertise of the Hawaiian-born-and-bred, husband-and-wife chef duo with MINA Group’s innovative approach to upscale dining and Salesforce’s “ohana” culture.